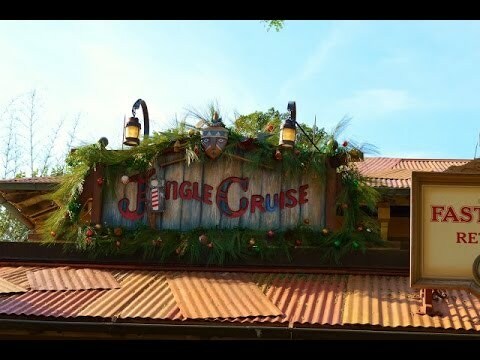 Video "Jingle Cruise" Official Video! This is a video of the new holiday version of the Jungle Cruise at the Magic Kingdom. It must be a soft opening because most part, it's pretty much the same but with holiday jokes from the skipper and some lights around some trees. A better video might pop up soon. "Imagination is something that belongs to all of us!" Re: &quot;Jingle Cruise&quot; Official Video! Rode this today and waited over an hr for it. Wasn't worth it at all. Same cruise just boats and props dressed up a bit in the line. Jokes pretty much the same except for the greeting at the beginning was a holiday themed joke. But I think they could've gone with lights that look more obviously like antiques. If this is all they are doing, then fine with me. Mostly just seems like some seasonal jokes and some dressing up of the queue area. The ride still seems in tact. I also find it easy enough to ignore or dismiss the jokes. They don't come out in my photos, anyway. ORDDU: My sisters and I rode this attraction yesterday and were not impressed. I was going to ride this today but never got around to it. Got a Fastpass because the standby line was 50 or 60 minutes around 2pm. I never got back to that part of the park until later and then during the Christmas party next time I went by there standby was 35 minutes (no Fastpass during the parties) and I skipped it then too. Oh well. Here's a video of Jingle Cruise at Disneyland. I think it would be better if they hadn't announced it. If people would have shown up (not expecting it), then their expectations would have been exceeded. But since Disney announced and marketed the idea, people expected The JINGLE Cruise and they got something less than what they hoped for. Jingle Cruise could have been better in terms of adding more, not necessarily a problem with what is there, (and maybe it will improve with each iteration), but Disney didn't really "market" it as they just put up a post on the Disney blog which covers everything from Tony Baxter to candy canes on Main Street, as far I know, there weren't any commercials on television, radio, and no ads in print or on the internet. Hence, 97% of casual tourists have no idea and will stumble upon it, I know a couple families who are going to DLR during Christmas and certainly don't know about this. The small post on the Disney blog got blown up into something big, IMHO. At any rate, at least its much better than the regular Jungle Cruise during the holiday for me. Recently they gave Disneyland's an upgrade by turning the trashed camp into a a wreck of presents and gave the gorillas scarves, santa hats and beards. I don't know if it happened at WDW but they honestly should've done that sooner; Like, oh I don't know, when the darn thing opened.